I got this off GunBroker, so now my hunt is over. I knew it was going to be a great range gun, but the ease of shooting it still surprised me. After spending so much time only shooting small concealed carry pistols, the full-sized hefty T9 is like putting on sneakers after wearing dress shoes. The serial number indicates a manufacture date of 2003. It seems like Kahr must have made a bunch of T9s in 2003 and 2004, because most people I encounter with T9s have the "old style" pistols. The action is SLICK. The all steel construction and long rails make the slide feel like it's on ball bearings. The trigger is smooth. Best trigger of any of my Kahrs, with the possible exception of the CM9 on which I did a mirror polish of the trigger bar. The night sights are dead, of course. There will be a set of Dawson Precisions in the future, as they're the only game in town. This was a used purchase,so no box and only one magazine. That's a bit disappointing, but I got it for $470 plus shipping and transfer, so my T9 was $510 total. Since new ones are $800 or so, I feel I did OK. I will eventually buy a factory box and manual to maintain the provenance and quash my OCD. LOL I do wish Kahr's magazines were less expensive, but they are what they are. I will eventually need to find an OWB leather holster. This is turning out to be more difficult than I thought. And of course, I am in the process of wet-sanding and polishing it. Aaaaaaaaand that's now bookmarked. Thanks a lot! Lots of interesting options there. Excellent price on a very nice find. Enjoy. This is a Mitch Rosen Premier I bought for a K9 but by massaging the muzzle end of the holster a bit the T9 fit perfectly and extended out just a fraction of an inch. 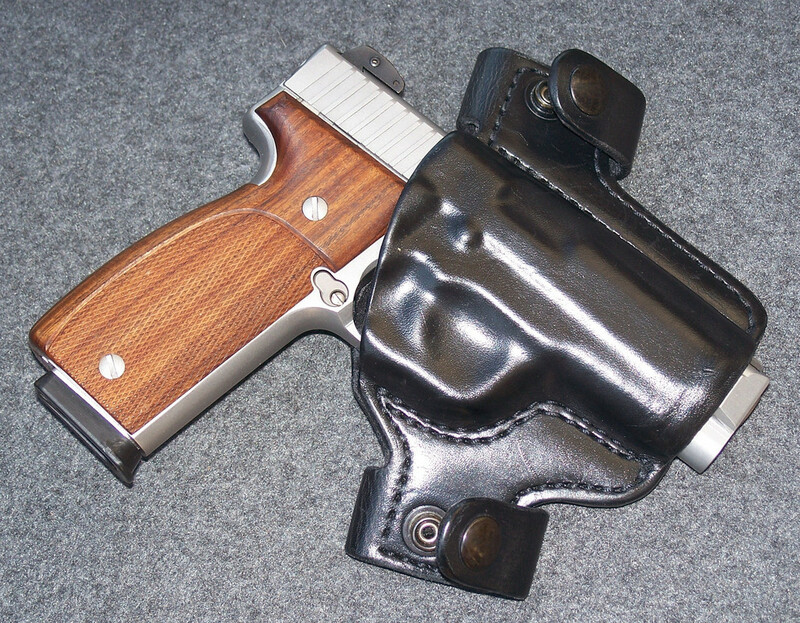 Good holster that carries well. "...but the ease of shooting it still surprised me. After spending so much time only shooting small concealed carry pistols, the full-sized hefty T9 is like putting on sneakers after wearing dress shoes. LOL, hey you owe me a new keyboard -- as my "Avatar & Water" are now everywhere!!! Careful.... You just might change those "sneakers" into "ballet shoes" if you make it too shiny!!! More like into corfams. I look forward to seeing pics of it polished. Thanks, Greg. I wasn't aware Trijicon could do that. Makes things easy.